Welcome to Sevii Islands, where the next part of your journey takes place. You'll split your time among three islands, named One, Two, and Three Island. It's here that you'll have the opportunity to catch the famous Moltres. For now though, spend some time exploring. When you first arrive, you'll be escorted by Bill to the local Pokemon Center, where you'll meet with Bill's friend, Celio, who's in charge of getting the local P.C. network up and running. 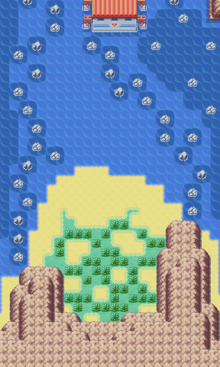 You'll be given a Tri-Pass, so you can ride the boat between the islands, a second page to your map that shows some of the Sevii Islands, and a Meteorite to give to a friend of Celio's, who resides in Two Island. 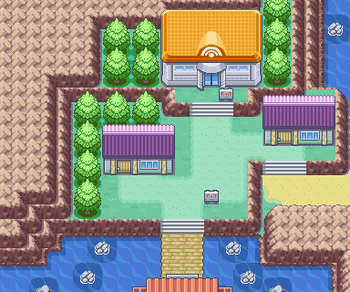 One Island is a small community, consisting of a Pokemon Net Center with a unique machine (one that lets you trade between Ruby, Sapphire, and Pokemon Coliseum, but you won't be able to use it for a while). In addition, if you Surf left (from the dock), you will see Treasure Beach to the south, and if head right and Surf north, you'll head towards Kindle Road. This is the way you must eventually follow to catch Moltres. Feel free to explore Treasure Beach while you are here, but after you are done, it's best if you just head back to the ferry and set sail for Two Island. From One Island, head south by Surfing, and you will find yourself at Treasure Beach. This slightly hidden beach is an optional area, but it nevertheless hides quite a few surprises for you. People tend to throw away so much stuff into the sea, and it seems that many of their valuable Items constantly end washed up here! Visit Treasure Beach often, as the items in this area seem to reappear after a while! Ultra Ball: Randomly placed. Use Itemfinder to find it. Can regenerate. Pearl: Randomly placed. Use Itemfinder to find it. Can regenerate. Big Pearl: Randomly placed. Use Itemfinder to find it. Can regenerate. Stardust: Randomly placed. Use Itemfinder to find it. Can regenerate. Star Piece: Randomly placed. Use Itemfinder to find it. Can regenerate. This page was last edited on 4 February 2019, at 02:02. This page has been accessed 318,166 times.